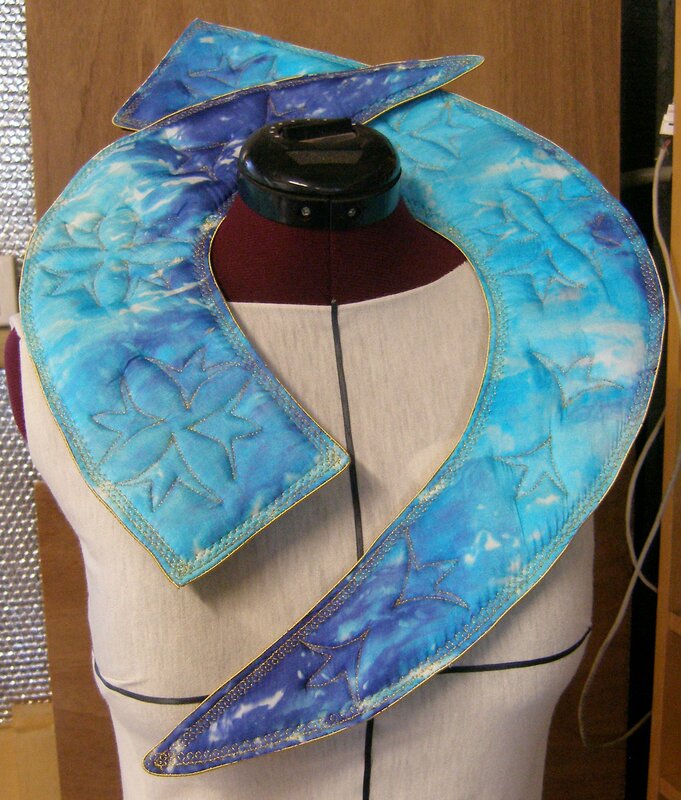 The two supporting panels are elongated versions of the wings and they curve up behind the head of the wearer. I had worked out from my samples that I needed two layers of wadding to get the level of padding I wanted for the surface, so the first task was to layer the wadding and top silk onto Wireform and to stitch this with the lotus flower shape I had prepared. As well as the lotus flower I added more gold stitching along the edges using a decorative machine stitch similar to the geometric borders used in some of the jewellery. Gilt Pearl Purl No 2 was stitched around the edge to bring more gold into the colour scheme. The Wireform wasn’t sturdy enough by itself to hold the pieces in place, so I cut matching shapes out of strong cardboard and covered these in black velvet. Before sandwiching the front and back pieces together, I fixed magnetic clasps in place through the layers. 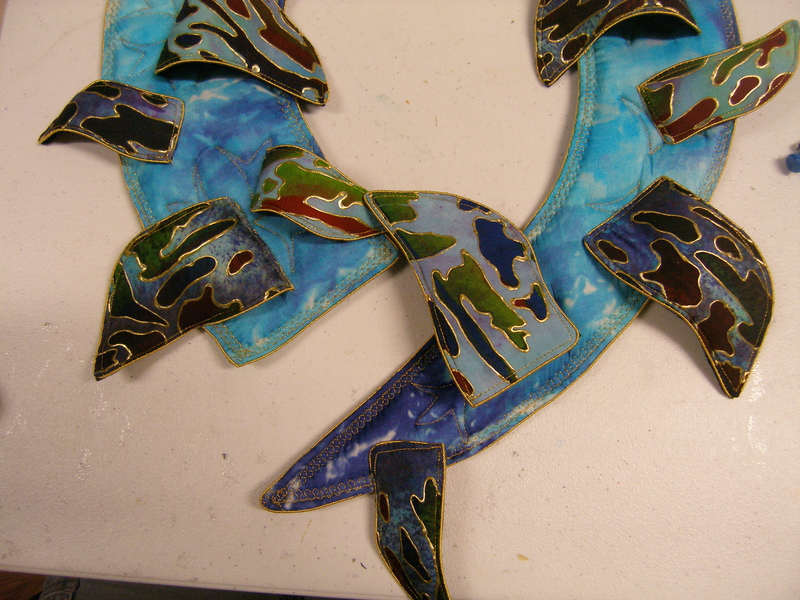 Although the neckpiece fits over the neck of a tailor’s dummy in one piece, it would not fit over a human head so needed to be in two pieces that could be firmly joined together. Once assembled I tried the neckpiece on my tailor’s dummy to check the fit and how it would sit. The neckpiece sits well as the cardboard provides structure but the underlying layer of Wireform allows it to be bent to shape and is strong enough to hold that shape. The final stage was to start adding the wings. These were quite fiddly to stitch due to the stiffness of the supporting panels. I swapped over a large and small wing after sewing the small one in place according to my original plan as I decided the larger one would look better. The difference is in the two photos below with the first one showing the small wing stitched in place and the second photo with the larger wing just placed on top to see how it would look. 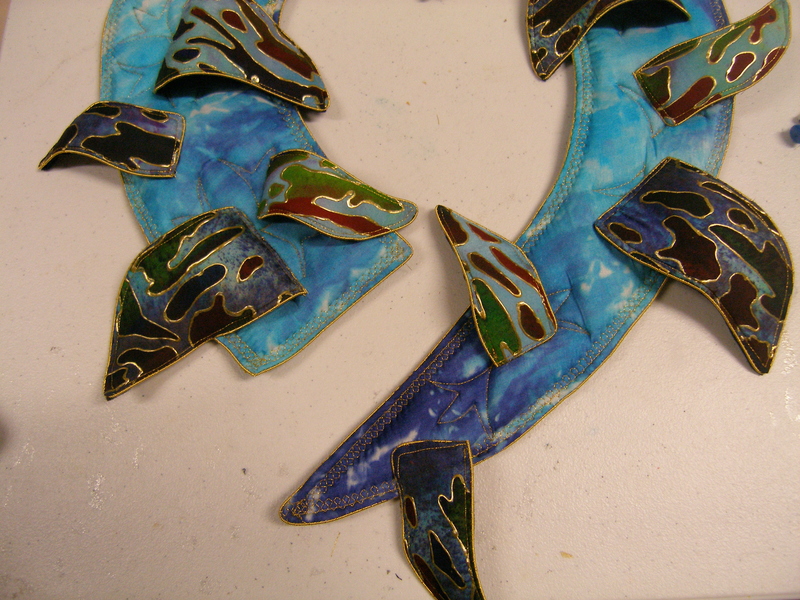 My next log entry will show the finished neckpiece. 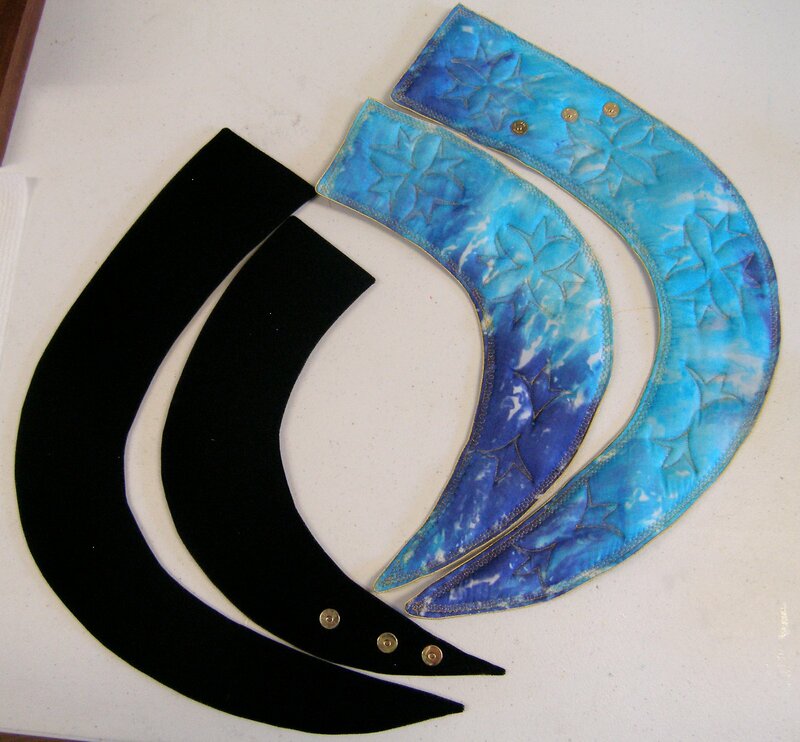 This is beautiful and exciting, Christie, I’m looking forward to seeing the finished piece!